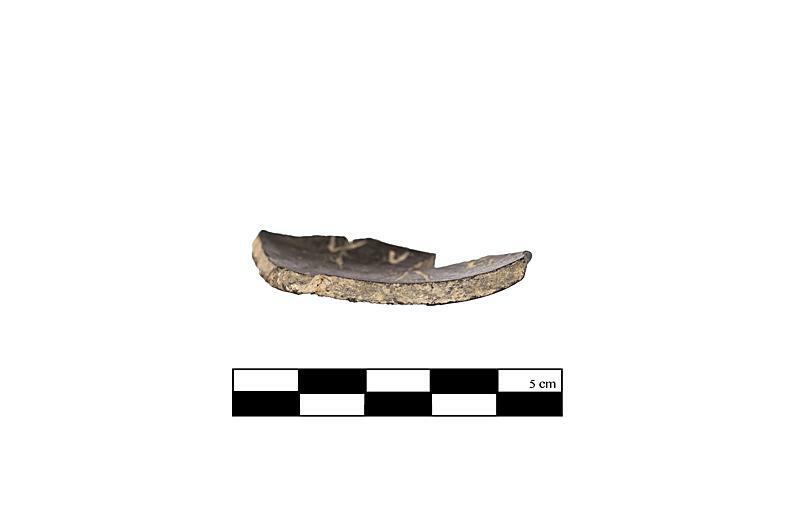 Description Fragment preserves portions of a rounded bucchero rim. Some incised marks and perhaps inscribed letters are visible on the concave face. Three possible letters are visible along the upper, interior rim. Two take the general form of upsilons while the rightmost appears to be a mu. Moving away from the rim, a curvilinear line runs the length of the fragment, beneath which are several individually delineated hatched marks. One additional upsilon shape, or perhaps simply a triangular shape, is attached to this curvilinear line in approximately an 180 degree orientation to the other letters, possible suggesting the back of an animal.